A Magical Birthday to Remember! You can have our nostalgic ice cream truck come to your party with ice cream only or with ice cream and an amazing magic show! 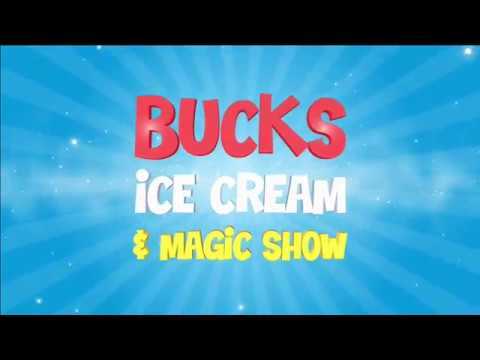 Buck Ice Cream and Magic Show for kid’s birthday parties is tailor made for children 4 – 9 years of age. A high-energy performance with lots of audience participation and interaction loved by Kids and adults alike. The show is designed with one purpose: Make the Birthday child the STAR of the show. I’ve been performing Children’s Birthday Party Magic Shows for 10 years and have helped thousands of parents have stress free and amazing parties in Charlotte and the surrounding communities with a super fun and interactive magic show featuring “Oreo” the kid friendly bunny! With over 60 Five star reviews on Google and Facebook! never forget the day they were the star of the show! We service communities within 30 miles of Charlotte, NC. We will set up the show and then park down the street and wait for everyone to come outside before coming into the party. We will come down the street with our classic colorful nostalgic ice cream truck. We will be playing birthday music, sirens wailing, flags waving and horns honking. We will then begin the magic show starring your Birthday child. We will arrive at your party location (home, park, church, community center, etc.) hidden down the street, ahead of your scheduled time to make final preparations. We will call a few moments before your party start time to make sure you’re ready. Once everyone is outside, just call or text us that you are ready and we will come down the street with our classic colorful nostalgic ice cream truck. We will be playing birthday music, sirens wailing, flags waving and horns honking. Once the children realize we are there just for them, they go nuts! Some of the parents do too. Why not? Who wouldn’t want their own private ice cream truck? Upon arrival we will either begin serving everyone their favorite treat or begin the magic show. ***Snow cones are great alternative for those who have nut allergies, lactose intolerance or a gluten free diet. We had Buck at my daughter’s 4th birthday party and he was a huge hit!! He made her feel so special, entertained the kids and was so great to work with. After the event I had so many people ask me for his information and tell me how cute of a party it was with him there. He definitely made my daughters day very special and I highly recommend Buck and his ice cream truck!! Bucks Ice Cream was the biggest surprise of my daughter’s birthday party, she and her sister loved participating in the magic show and the kids all loved Oreo! Thanks so much for helping to make our little girl’s special day one she will never forget! Bucks Ice Cream Truck came to my daughters 7th birthday party and it was seriously one of the best birthday parties we have been to (and most reasonably priced). Buck put on a fantastic magic show in which the kids were super entertained and had a variety of ice cream and other treats to choose from. My daughter was so happy to share such a special day with all of her friends and so many wonderful memories were made. I highly suggest Buck for your next event as he was great to work. We just had Buck & his ice cream truck come to our house for our son’s 6th birthday party…..he is GREAT! There were 12-14 kids sitting on my driveway all completely enthralled. They loved it and the ice cream selection was fantastic…..happy parents! Would definitely recommend, best money I’ve spent on a kids’ birthday party! the party starts to make sure everyone is there. We want the focus to be on the Birthday child and not late arriving guests.